The last few times that I have posted homemade pudding recipes I have had requests for a homemade vanilla pudding. Homemade vanilla pudding is a classic pudding recipe. It is one of the easiest homemade puddings to make and it is so versatile. What I love about homemade puddings is that they contain everyday ingredients. I almost always have on hand the ingredients that I need to make it, and vanilla pudding is the most versatile to make because you can use it in so many different ways. We often eat this plain, but we also love it served with fruit. I recently put together a video on how to make homemade pudding, for those that have never made it before. I also share a few tips for making pudding in the video that you may enjoy. Combine sugar, salt, and cornstarch in a saucepan. Whisk in cream, milk, and egg yolks, Cook over medium high heat, stirring constantly for 3-5 minutes or until thickened. Remove from heat. Stir in vanilla and butter. Whisk until butter is melted. Strain through a fine mesh sieve to remove any lumps. Cover with plastic wrap for storage. To prevent a skin or film from forming be sure to place plastic wrap up against the pudding, not just over the top of the bowl. My kids like to eat this plain, but I like it served with raspberries or blueberries. Thank you so much for the vanilla pudding recipe! My son will be thrilled! I am going to make it for him for tonight’s dessert. I’ve always made pudding with milk, sugar, and cornstarch. The egg yolks in your recipe sound intriguing. @Julia, Not all my homemade puddings contain eggs. My homemade chocolate pudding doesn’t, but in a vanilla pudding I think the eggs help give it a richer and better taste and texture. @Angela, You made my day and made this video worth doing. I was hoping it would help show how easy it was to make. I am so glad that your family enjoyed. I think they will love the other versions that I have. Could I just add mashed bananas to this or do you happen to have a recipe for banana pudding? @Shannon W., I layer it with sliced bananas for banana pudding. So about 1/3 of the pudding a layer of sliced banana, layer of pudding, etc. You will want to do this with cooled pudding and eat soon after slicing the bananas as they do turn brown, but it is really good this way. Add a little whipped cream and it is even better. Thanks! I’ve been looking for a good vanilla pudding recipe! My son is gluten free & dairy free…can I substitute the butter with coconut oil or something else? Thanks! @Karrie, I am guessing yes, although we are not dairy free so I have never tried it. I would probably just use what you normally use in place of butter. Now I am curious what liquid do you use in place of the milk in a recipe like this? Do you use rice or almond milk? We typically use flax & coconut oil as a replacement for butter…not sure how it will work with the pudding, but we’ll give it a shot! We keep almond & coconut milk on hand! I hope it works the same as cow’s milk! Thanks! @Karrie, The flax might change the texture a little in this one, I might just use the coconut oil. I would love to hear if it works with the changes you make to it. I made this recipe tonight and it was wonderful! I skipped the straining part and it was still perfect. I did cook it very slowly and allowed it thicken gradually, whisking it all the time. It was just perfect. Thank you. @Bonnie, Thanks for letting me know. I am glad to hear that you liked it. My family does not like any chunks in their so I always strain it to be extra sure that they are none, but I am happy to hear that you did not need to do that step. Is this comparable in thickness and taste to Jell-O (not instant) vanilla pudding? I’ve been looking for something whiter … this might just be it! @Karen, No this does not taste or look like the boxed Jello puddings. This is much creamier and it not yellow orange in color. This is not white, but it is lighter in color than the boxed vanilla pudding. I hope that helps. So when I originally asked, I knew it wasn’t going to be yellow-orange; that’s what I was hoping to get away from. I have a cake frosting recipe that uses pudding, and my family, friends and customers love it, so I was leery about making the switch from boxed pudding without knowing whether this pudding would be comparable in other respects. However, I needed a whiter frosting for my daughter’s First Communion cake, so I decided to give your recipe a try. I am happy to say that we liked it even better! Since then, it’s all I use. I do cut the liquid by half (I did the same when I used boxed) and cook over low heat. It takes a long time, but it gets to the thickness I need, and without lumps. Since my goal is a whiter frosting, I also use clear vanilla. Thanks! I love that idea for using homemade pudding! I will have to try it! Thanks so much for sharing what you did. I love hearing how readers make my recipes work for them. And I need to get some clear vanilla for recipes like this. I have never used it, but need to keep it on hand. To get a whiter product you might also cut down on some of the egg yolks. And you’re right, the clear vanilla helps a lot. This was my first homemade pudding and I can’t believe I’ve been missing out on it for all of these years! This tasted like a warm liquid version of our homemade ice cream, we loved it! Even my sister-in-law that doesn’t like pudding because of the texture liked this. 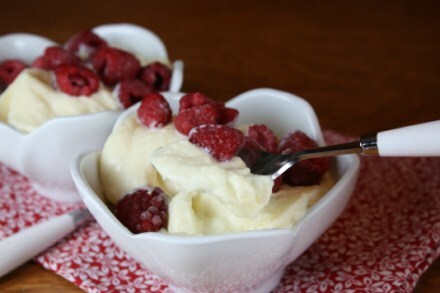 This was one of the recipes I made for my May GF Blogger Adoption of you. It was delicious and very flavorful! This recipe is marvelous! I never knew you could make pudding at home. I added less sugar (it seemed too sweet for me) and I left out on the vanilla and butter because I didn’t have it on hand, but it tasted so good anyway! I suggest that you stir it until it thickens so much that you could actually see it kind of sticking together. I made the second batch a little less thick but I would have rather had it thicker. It tasted wonderful. This recipe made my day. Thank you. @Charlotte, I am so glad that you enjoyed it! Thanks for letting me know. I don’t bother straining it. I’ve never noticed any lumps. I love homemade pudding, haven’t had it in years… but I made this tonight and it didn’t thicken for me, it stayed all soupy 🙁 not sure what I did wrong. You probably used teaspoons instead of tablespoons for the cornstarch! I grew up on only boxed pudding and I tried this recipe for the first time tonight. It was terrific and we will never go back to boxed. Thanks for sharing! My husband gives his hearty thanks as well! I am so glad that you both enjoyed it! Thanks for letting me know. And once you get the basics of how to make homemade pudding down there are so many versions and flavors you can make. I have always made banana pudding with the box puddings, but wanted it to be more homemade so now I can’t wait to try this recipe for a cook off, lol. What does this recipe yield normally? I am not sure the exact amount this yields, but it usually serves my family of 5 dessert with some left over. I hope that helps. Wow! This pudding is much, much, much better than the box mix! I’m going to cook this as often as I can! Thank you for the recipe! I never realized that homemade pudding is made with ingredients that I typically have in the house . Well all but cream, I don’t keep cream on hand. I found this while searching for homemade pudding as I was looking to try something different with my bananas in my crepes tomorrow morning. I hope the thick bananas will make up the difference of the cream that I don’t have. You can use milk it is just not quite as rich, but it should be fine. I hope you enjoy it! And yes homemade pudding is made with pantry staples and is so easy! I just watched your video on Vimeo and it inspired me to give this a try. Thanks for sharing such great recipes and advice! Sounds super yummy!! However, my 10 month old can’t have any corn-based product, so could the cornstarch be substituted with something else?? You could try flour, but I think it would make it kind of pastey and not the same texture. Can you use something like arrowroot or potato starch to thicken things? I made this pudding again tonight. Love it. I used tapioca starch tonight because I was out of tapioca starch. I love it with a little bit of cinnamon sprinkled on top! So that didn’t make sense. I use either tapioca or potato starch. Thanks for letting me know. I am glad to know that potato and tapioca starch work in it! I just made this – YUM!! Thank you!!! It reminds me of something, but I can’t figure out what. I have not tried your recipe yet. I have had trouble in the past with the pudding thickening. I only saw one review that said she could not get the pudding to thicken. All the others reviews are great. I can’t wait to try your recipe. Can you give me any tips before I start? In the past, I stir and stir and it doesn’t thicken. I’m really want to make this……And I want it to come out like yours on the video. Besides the tips in the video I really don’t have anything to add. It really is quite simple and I hope you enjoy it! Yes! I did it! I made the pudding again, WOW is all I can say. It is so good, yummy and creamy! At the last minute or so, like magic, it thickened. I did 2 things different from the last unsuccessful try. I used a new sauce pan with an aluminum heavy bottom and made sure I stirred very very briskly constantly. No more runny, thin, pudding! I will be making this again and again! No more box or packaged pudding! Now I can’t wait to try more flavors! Thanks again! Just made this recipe. It was so easy! I was looking for the perfect recipe, and I think I found it!! I used heavy cream and whole milk over a medium heat. Bringing it to a boil slowly to avoid lumps. Most recipes for pudding that I’ve tried always calls to “temper” the eggs before adding to the hot mixture. So this recipe cut a step and still came out great!! I will be using this for a banana cream pie. I also chilled the bowl I transferred the hot pudding to. Thanks for sharing, going to make this again!! I am so glad that it turned out well for you. I love it that so many people have enjoyed this recipe. Thanks for letting me know! So as I told you, I used this pudding to make a banana cream pie. It’s gone! Every last bite! This pudding made my pie tase from a bakery! But I do have a question, would I be able to add two more tablespoons of corn starch to the recipe without changing the flavor? Yes, I think you could easily add a little more cornstarch to thicken it for a pie. I am so glad it turned out well for you! Umm.. hey Lynn can you use white Vanilla extract to make the pudding?? I have never used white/clear vanilla extract but I think it would work fine. WOW! I love all things vanilla, especially pudding! I grew up on Jello pudding, I remember standing on a step stool watching my mom “cook” it with a wooden spoon. For years, I believed that pudding had some mystery ingredient known only by the makers of Jello! Now that I am a mommy myself, I became a bit more aware of procssed foods and such, venturing out a bit and trying homade recipes. I had tried no less then half dozen recipes that I had found online, only to be dissapointed. I felt I was spending a lot of time, and money, to make a mediocre pudding. The other day, I was craving pudding all day, sent the hubby to the store and he mistakenly came home with instant pudding (I’d rather eat dirt!). Once again, I got online and found your video and recipe. I thought it looked simple enough and gave it a try. IT IS AMAZING! AWESOME! UNBELIEVABLE! YUMMY X’S 100000! FINALLY! This recipe blows all others and any boxed pudding out of the water! I will NEVER make another box of pudding and, will look no further, THIS IS PERFECTION! I did’nt have cream and only 1% milk so, I changed the recipe a bit. I first combined 2 cups of milk with the corstarch, sugar and salt. Then put 3 egg yolks in my measuring cup and added enough milk to them to equal one cup of fluid total. I then whisked it into the first two in the saucepan. Using the technique on the video, I whisked until thick and creamy. I kept the butter and vanilla the same and created the BEST VANILLA PUDDING ON THE PLANET! This is the first recipe of yours I’ve ever tried….Needless to say, it definitely won’t be the last! THANK YOU SO MUCH! Hey! I just tried making this for my little brother… I’m definitely no cook, but it seemed simple enough. I followed the instructions exactly, as far as I can tell, but it definitely did not yield the right thickness. It was still quite soupy by the time I added the butter and vanilla. 🙁 I cooked it about 7 minutes, perhaps even that wasn’t long enough? It was over medium heat, it may not have been hot enough either. I stuck it in the fridge to see if it thickens when cooled, but that doesn’t seem to be working either. Sorry this is so long, but any tips for the thickness? Thanks a billion! I am sorry that you had trouble with it. I am guessing that it did not get hot enough. I would try cooking it a little hotter next time. Each stove is a little different when it comes to that. I hope that helps and again I am sorry that you had trouble with it. I was looking up what to do with the two egg yolks I had leftover from baking a banana cake, and this is what came up.The vanilla pudding turned out so delicious! I’ve only ever had the ready-made ones which I don’t like at all so this was awesome! And super easy too. I will try making a chocolate pudding next. Thanks! Delicious recipe and very simple to make!! It filled four small bowls to the top. I found my stirring time before it thickened to be 6-8 minutes. Thank you for sharing, I really enjoy pudding and I don’t think I’ll ever buy store bought, pre-made or boxes, again! Thanks I am so glad you enjoyed it! Oh- my! Apparently we both need to go to the eye Dr. ! Good grief! I see it now. Sorry. This was delicious – thanks for posting! Hi Lynn, My daughters asked me to post a comment to let you know that the pudding is two thumbs up. I accidently put in too much milk at first so I added more corn starch and turned up the heat and it thickened nicely. Thanks for the great treat. Tell your girls I am really glad they enjoyed it! My 5 yo daughter declared she wanted to make pudding today and a quick Google search yielded your website. A short time later the girls and I have a delicious chocolate (we added chocolate before I realized you had a different recipe for that ;>) pudding! I am so glad you found my site and enjoyed the pudding! Thanks for letting me know! How much does this recipie make because I might be using it for my culinary final in school? I would say 6-8 depending on how large the serving size. I hope you enjoy it. If you use it I would love to hear how it turns out. How long will it keep in the refrigerator? I am in charge of the desserts for easter and am trying to do some prep work a few days ahead of time. I think the day before is fine. We eat it a couple of days later, but the texture is not quite as good. I have made it before though on a Saturday and taken it to a church dinner on Sunday. So, the day before should be fine. What kind of cream do you put? Is it heavy whipping cream? Yes, it is heavy whipping cream. I hope you enjoy the pudding. Why does my pudding keep liquifying after it cools down. If that happens it usually stirs back together. Does it stir back together fine? This is, hands down, the best vanilla pudding recipe I have ever made!!! Not to mention the fact that it is probably the easiest. Everyone I had over for dinner wanted seconds on the vanilla pudding!!! Thank you so much for sharing! LOVE IT!!! I am so glad you enjoy it so much. Pudding is one of those things that so many people don’t make homemade, so I love it when people make this and enjoy it. Thanks for letting me know. Just made this and its deliscious & easy! My daughter will be 2 soon and i wanted to let her try pudding but refused to give her box brand because of all the aweful ingredients. I used all organic dairy & sugar so i feel much better about her having So glad i found your recipe! i’m going to try the rice pudding next time. I can’t eat the boxed pudding because of the extra additives. I’m allergic to the artificial coloring and flavoring. If its all natural I don’t have a problem with it. It took me days to find a recipie I liked. Will be trying this tomarrow. Yea I miss pudding. I AM HAPPY TO SAY THAT USING A STRAINER TO GET THE LUMPS OUT OF THE PUDDING MADE ALL THE DIFFERENCE IN THE WORLD WHEN IT CAME TO TASTE. THANK YOU SO MUCH FOR THE TIP. Oh my goodness!!!!! This pudding is even better than cook and serve vanilla pudding!!! I followed your directions but I put the egg. milk, and cream in the pot first, mixed the dry ingred in a bowl and slowly added the dry ingred. to the wet ingred in the pot and used a wire whisk. I never needed to strain anything off. It was creamy and absloutely delicious. I am embrassing this making everything from scratch mentality and it really is easy and so much better for you!!!!! Best pudding I’ve ever had! It’s going to be a Summer staple this year. Thanks for sharing! what is corn starch. could it be the pudding powder? Are you in the US? If not you could easily use another thicken for it. The texture may be a little different, but it will work. What do you think about substituting potato starch for the cornstarch? Or any other ideas? I have a family member who is allergic to corn. I think potato starch would work fine. I have used it in gravy and it works so I think it would work fine in pudding. I hope you enjoy it! I add 3 browned bananas to a food processor with the vanilla and butter, then sear it on low in a small pan before adding the flavor to the pudding and serve it to guests with home made wafer sticks. It tastes delicious! I am glad you enjoyed it! I love the idea of how you added banana to it. Thanks for sharing what you did! I substituted a cup of coconut milk for the regular milk and added another layer of flavour to it! Can you use Ensure instead of milk to make jell-o cook&serve vanilla pudding? My daughter needs the extra nutrition from the Ensure due to digestion problems. I have never tried it. I think it might be slightly different in taste and in texture, but I would try it. I don’t see why you couldn’t make homemade pudding with Ensure or something like it. I might start by using it as part of the liquid and if it works increase the amount of Ensure you are using until you have it like you want. If it works I would love to hear. I think others might be interested.